Olee Sleep, initially into mattresses segment are known to offer best quality mattresses at affordable prices. Over the course of time, Olee Sleep has become a market leader in budget mattresses segment. Thereafter, the company has also ventured into manufacturing bed frames. Their 18 inch and 14 inch bed frames in T-3000 models have again gained remarkable customer satisfaction within a very short span. Following are quick specifications before moving into in-depth review. Both 14 inch and 18 inch Olee Sleep T-3000 bed frames are made from heavy duty steel. How sturdy is the frame? Olee T-3000 bed frames come with 9 legs. The 3 legs in the middle are what add to the stability. The middle section takes maximum pressure from bodily movements. While few bed frames have no middle legs, some come with just 2. If you have ever noticed, when we tend to sit on a bed, we mostly choose to sit in the middle rather than corners. And this is where maximum body weight goes into. Hence, having middle legs adds to frame’s overall durability and longevity. Olee Sleep T-3000 coming with 3 middle legs means the frame can absorb as much weight as possible without any scope for bending or breaking. Owing to the steel metal construction and the sturdiness of the frame, T-3000 King size models can easily sustain weights up to 2000 lbs. Considering two people sleeping on either a queen size or a king size version, 2000 lbs is pretty much on the higher side and more than sufficient for two people. T-3000 bed frame is not foldable, the main frame comes as a single unit. Foldable frames are an advantage only if you happen to use them once in a while and not as a regular bed. 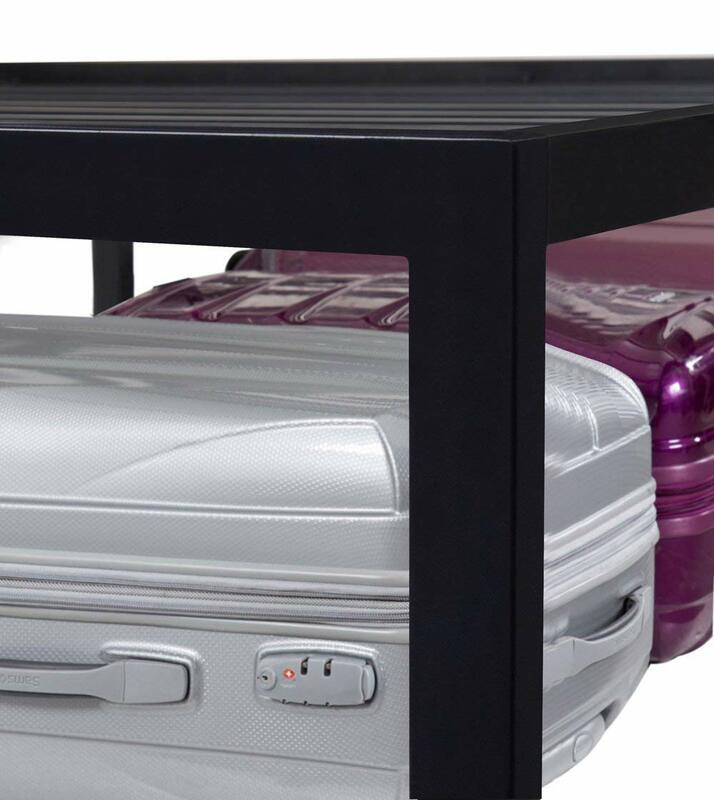 Especially when you have space constraints at home, foldable frame offers you the ease to pack it and store it when not needed. But if you wish to use a bed frame as your regular bed, then better to go with non-foldable bed frame models as they are relatively better option owing to their uniformity and even sleeping surface. Olee Sleep has designed its T-3000 model bed frames to work both as stand alone as well as with box springs. This is, in fact, double advantage as most other bed frames limit to work as only standalone. But if you wish to use Olee Sleep bed frame with a box spring, then it is always advised to use a box spring that is in good shape. Else, not just the frame but even the mattress might develop issues in the long run. 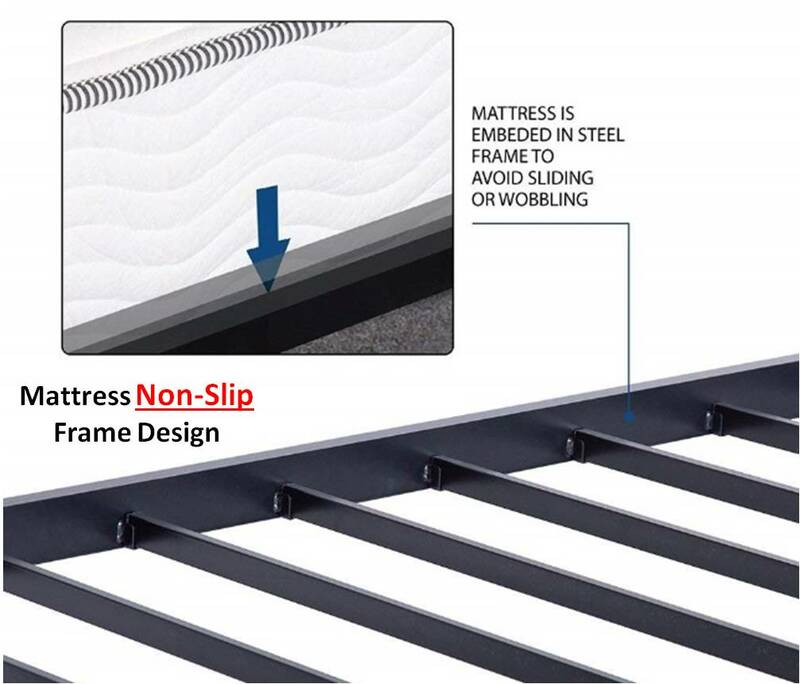 The design also includes raised sidebars known as Non-Slip design so as to hold the mattress from sliding or slipping. Yet again, most bed frames have no provision to attach a headboard. However, Olee T-3000 bed frame does come with slots to attach headboards. But the trick being that the units are not labelled. Hence, you have to carefully check for the top of the bed units that have slots. It won’t take anytime doing it though. 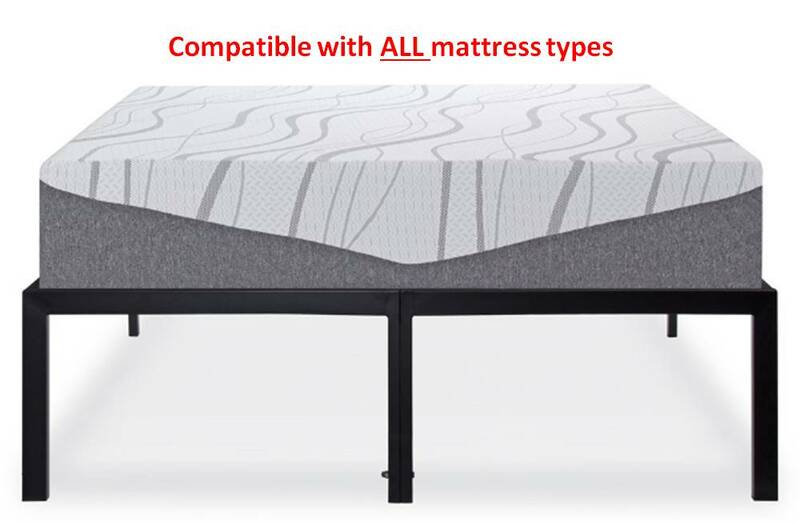 Olee Sleep T-3000 bed frames are compatible with a wide range of mattresses. There is virtually no limit on this front. Even though you can directly place the mattress on the frame but in view of mattress durability it is always suggested to place a flat board on the surface before placing a mattress. This is in general applicable to both memory foam mattresses and Tempurpedic mattresses. More specific, Tempurpedic mattresses have to have a flat board, it’s in fact a must. However, spring mattresses have no such terms and conditions. They can be placed on the frame directly without any second thoughts. As mentioned earlier, T-3000 bed frame comes in two different versions, one that is 14 inches tall and the other 18 inches. Olee Sleep 14 inches bed frame offers 13 inches of under the bed storage while Olee 18 inches bed frame offers 16.5 inches of under the bed storage space. If you are specifically looking for extra storage space then Olee 18 inches bed frame is the best as it offers the highest storage space. There are only very few bed frames that come with 18 inches height but of them all, Olee Sleep is the only reliable brand name. There is no complicated science behind the assembly process. The instruction manual should help you with quick assembly. The only unit that you have to specifically lookout for is the head section. It carries the slots for headboard assembly. Rest all units, although not numbered are easy to put together. Warranty is another prime indicator while choosing at product. As said in the introduction, your investment into beds and mattresses should guarantee a performance for at least five years. And Olee Sleep offers 5 years of warranty on its T-3000 bed frames. Brand name matters and going for any offbeat brand that does not have a presence or recognition in the market is not a wise decision. Olee Sleep is a reliable brand name that has very good rating, customer satisfaction and considerable number of positive reviews. The price is too within budget. In fact, be it mattresses or bed frames, Olee Sleep is known to offer its products at affordable prices. T-3000 bed frames are surely a wise and worthy investment as they are also backed by a 5-Year warranty period.